Guided tour of 3-hours, visiting different places of tourist and cultural interest in the road and visit to the one of the best teams in the world, the Real Madrid. Enjoy a wonderful route of 3 hours duration by Madrid in a comfortable electric bike, with the option to enter the Santiago Bernabeu Stadium (see additional information). Ride through Cibeles square, the place where the Real Madrid fans gather to celebrate the victories. 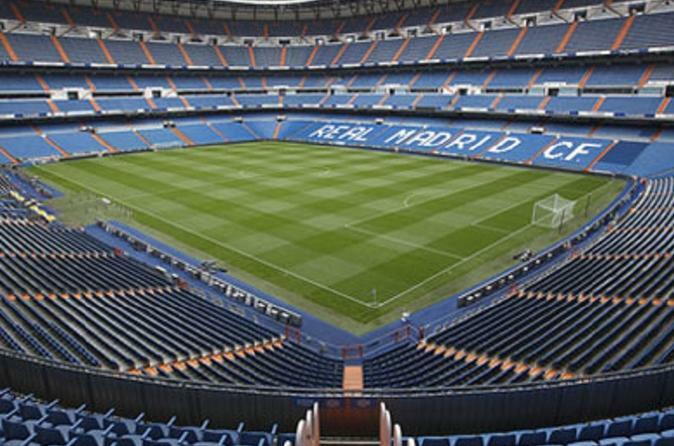 See the key places of the Real Madrid within the stadium, as the tunnel toward the locker room. Look at the exhibits inside the Museum of the stadium to learn more about the history of the club. Our Real Madrid’s Bernabeu Stadium e-bike tour is the best option for those that love football, history or architecture and want to see more of Madrid than the old town. Departing from Santiago Street, just around the corner from the Royal Palace and Opera Metro station, we will take you to see Plaza Mayor and ride along Puerta del Sol, actual center of Spain. Down the road, we will see Plaza de Cibeles, a place of pilgrimage for madridistas, where both team players and supporters celebrate all of their victories around the central fountain. We will go up the cute Paseo de Recoletos and continue along Paseo de la Castellana towards the stadium in a pleasant journey that otherwise would be a real hike if done walking. Once upon arrival at Santiago Bernabéu, you will have a one hour to visit the team’s trophies, enjoy an impressive panoramic view of the pitch and even enter the changing room to take pictures with the lockers of your favourite Real Madrid players. After the visit to and around the stadium, we will ride back to the centre riding along some of the most important buildings and monuments in Madrid, such as Colon Square, several ministries, the USA embassy or the Archeology Museum.